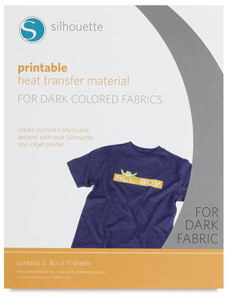 Design your own t-shirts and apparel with Silhouette Heat Transfer Material. Print any design directly onto the transfer sheet using an inkjet printer, and then iron them onto clothes and other fabrics for a professional, custom look. Choose Heat Transfer Material for light or dark fabrics, both sold in a package of five 8½" × 11" (22 cm × 28 cm) sheets. Note — This material can be used with the Silhouette CAMEO Electronic Cutting Tool (sold separately), or can be cut with scissors for less intricate designs.